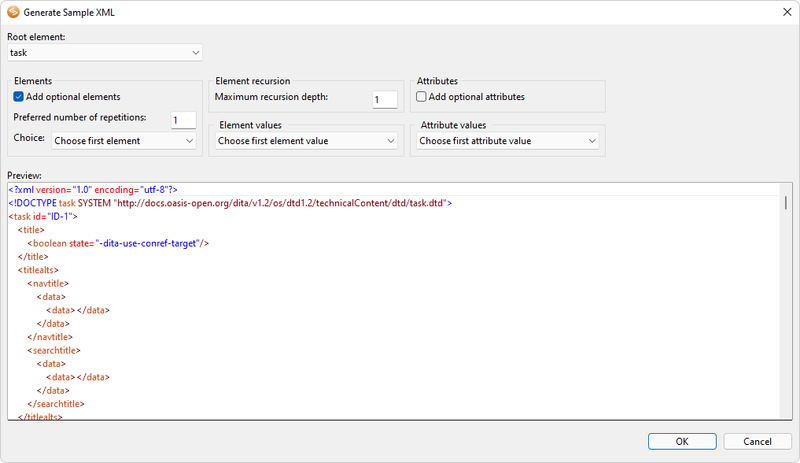 To generate XML from DTD open the DTD in XMLBlueprint and select Schema > Generate Sample XML from DTD... to open the Generate Sample XML dialog. • Root Element -- Choose the root element of the XML to be generated. • Prefix -- Specifies an optional prefix for the namespace of the root element. The prefix is invisible if the root element has no namespace. • Add optional elements -- If checked optional elements will be generated. • Preferred number of repetitions -- Specifies the preferred number of repetitions. • Choice -- Specifies what element will be generated: first, last, or random. • Maximum recursion depth -- Specifies the maximum recursion depth allowed. • Specifies what element values are generated: first, last, random, or none. • Add optional attributes -- If checked optional attributes will be generated. • Specifies what attribute values are generated: first, last, random, or none. copyright © 2002 - 2019 by XMLBlueprint XML Editor. all rights reserved.